Your kitchen is a hub for many activities, being used in a variety of ways on a daily basis. Unfortunately, the heavy use of this space can equate to a number of minor damages and annoyances that can all combine to inconvenience you and your family. Instead of learning to live with these quirks, many Georgia homeowners set out to find quality solutions for issues with their appliances, countertops, and cabinets. 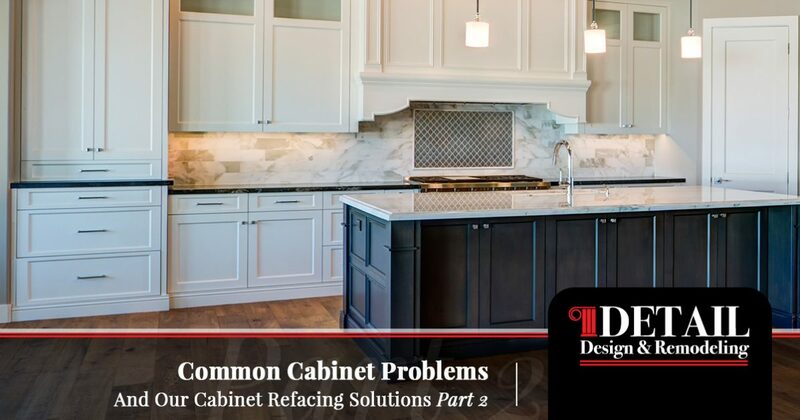 As a professional provider of cabinet refacing for Atlanta homes, Detail Design & Remodeling is proud to provide an economical solution for homeowners who are considering replacing their current kitchen cabinets. Our home remodeling contractors have the skills and equipment needed to provide a wide range of home renovation services, from minor repairs and cabinet resurfacing to full remodels, custom cabinets, and more. 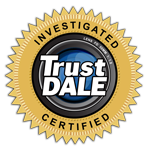 We’re here to offer premium cabinet refinishing services, but our company is available to help in any way that we can. Today, we’ll continue to discuss a few common kitchen cabinet problems that face Georgia homeowners. When done, be sure to reach out to our cabinet refacing experts to learn more about our cost-effective solutions! Over time, the repeated use of your cabinet doors will strip the screws and foil any future attempts at securing the hardware. This problem occurs all the time and plagues homeowners all over the world, but the good news is that multiple solutions are available. The easiest and most affordable answer is to dip four or five toothpicks into some wood glue and then stuff those toothpicks into the hole. You can then cut or break off the ends of the toothpicks to create a smooth surface. If the holes for your mounting screws have gone through extensive wear, it can also prove useful to follow the same process with matchsticks. An easy answer for holes that are not fully stripped is to move up one screw size to gain traction. You can up the diameter of your screw while retaining the same length, allowing for a more snug fit. Daily wear and tear can result in numerous imperfections along the face of your cabinets. From scrapes and scratches to gouges, your wood cabinets can benefit from some tender loving care. Homeowners can find success in making repairs for minor imperfections, utilizing wood fill products to smooth out issues. If your cabinets are looking much worse for the wear, you can also sand and restain everything to create a uniform look of quality. As always, reaching out to cabinet refinishing experts can result in amazing outcomes that are time- and cost-effective. Drawers that are loaded with heavy items can begin to sag over time, causing numerous logistical and aesthetic concerns for your kitchen. Repairing this issue can depend on how much time, effort, and money you want to invest. The easiest solution is to reinforce your drawer bottom with a sheet of plywood, providing extra support to protect from saggy outcomes. Simply size the bottom of your drawer, cut your plywood, and secure it with a decent amount of wood glue. If your drawer is too dire for this answer, you can benefit from replacing the actual bottom with a new piece. It may be difficult trying to find the right size and thickness for your drawer, but doing so will result in a quality long-term solution. It can also help to reach out to custom cabinet experts such as Detail Design & Remodeling for assistance. If your current cabinets are simply drab and dusty, replacing them may sound like the best solution. One smart and efficient way to update the looks of your cabinets without the cost of demolition and replacement is cabinet refacing. Our cabinet refinishing company excels in giving your existing products a durable and beautiful facelift, replacing the veneers on your cabinetry with real wood for a quality outcome. Detail Design’s services reduce the waste, downtime, and overall cost of your cabinet renovations. If your cabinets are looking worn down and defeated, it may be time to invest in kitchen cabinet refacing services. Detail Design & Remodeling is here to provide expert guidance and quality results for each and every client, delivering personalized results to deliver you the most value for your investment. If you are considering cabinet refacing in Georgia, be sure to contact us to see how we can help!